Byetta, Bydureon and Bydureon BCise are injectable drug pens manufactured by AstraZeneca to control blood sugar in people with Type 2 diabetes. They work by signaling the pancreas to make more insulin. People generally tolerate the dugs well, but Bydureon has a black box warning for thyroid tumors. Byetta is a twice-daily injectable drug approved by the U.S. Food and Drug Administration for the treatment of Type 2 diabetes. The drug works with diet and exercise to control blood sugar. Scientists derived the active ingredient, exenatide, from the saliva of the venomous Gila monster found in the southwestern United States. Some patients call the drug “Lizzy” or “Gilly” because of its origin, according to The New York Times. It has become popular with doctors and patients because of its ability to help people lose weight. Manufactured by San Diego-based Amylin Pharmaceuticals, Byetta was approved by the U.S. Food and Drug Administration in 2005. In January 2012, the FDA approved a once-weekly exenatide injection called Bydureon, which is an extended-release version of Byetta. The FDA had previously rejected Bydureon in 2010 because of evidence that the drug may cause heart-rhythm abnormalities. The agency required drug makers to conduct additional safety studies, according to an Amylin press release. In 2012, Bristol-Myers Squibb and AstraZeneca purchased Amylin. AstraZeneca acquired the diabetes drug assets from Bristol-Myers Squibb and now markets the Byetta family of medications, which also includes Bydureon BCise, a new injector pen approved in 2017. Byetta generated $176 million in revenue in 2017 while Bydureon generated $574 million, according to AstraZeneca’s 2017 annual report. Bydureon is a longer-lasting version of Byetta and is taken weekly instead of twice a day. It has a black box warning for thyroid tumors while Byetta does not. According to the Byetta website, the drug lowered A1C by an average of 0.7 percent to 0.9 percent in people who had started with an A1C of 7.9 percent to 8.6 percent. While exenatide is not a weight loss drug, it also helped people lose between 3.3 pounds and 5.7 pounds in studies that took place over 16 weeks to 30 weeks. The medication’s most common side effect is nausea when patients first start therapy. It may lessen over time. The drug’s rare and serious side effects include pancreatitis, and Bydureon and Bydureon BCise carry a black box warning for thyroid tumors. Exenatide may interact with oral medications by slowing their absorption, and there were some reports of bleeding in people who used warfarin with exenatide. Before they take exenatide, women should let their doctor know if they are pregnant or plan to become pregnant. Exenatide is part of a class of drugs called glucagon-like peptide-1 (GLP-1) receptor agonists. These drugs mimic the effects of the body’s natural GLP-1, a hormone that reacts to high blood sugar by increasing insulin production. Cells in the pancreas that respond to glucose are called beta cells. In studies, Byetta increased the responsiveness of beta cells and allowed for more insulin production. Once sugar levels stabilize, the insulin production stops. The “first-phase insulin response” usually occurs within 10 minutes of taking in glucose. In people with diabetes, defects in the beta cells prevent this first-phase insulin response from occurring. 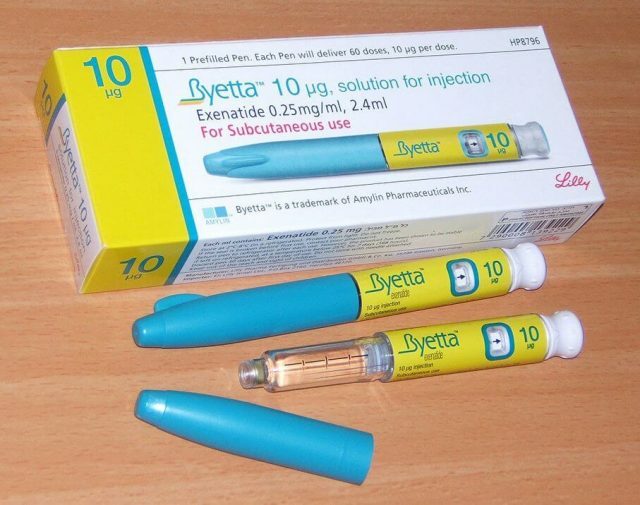 Byetta significantly increased the first-phase and second-phase insulin response in patients with Type 2 diabetes who took the drug during clinical trials. Byetta stops excess glucagon secretion during periods of high blood sugar. Glucagon is a hormone released by the pancreas. It increases blood sugar produced by the liver. By lowering glucagon secretion, the drug makes the liver produce less sugar and lowers the demand for insulin. By slowing gastric emptying after meals, Byetta slows the rate at which glucose enters the blood. Clinical studies for exenatide showed it reduced food intake in animals and humans. Byetta, Bydureon and Bydureon BCise are all injectable medications, but the dosage and administration instructions may change depending on which one a doctor prescribes. Patients should not share injector pens or needles because they may transmit infections or diseases to themselves or others. Doctors or other health care providers must instruct the patient on how to inject these medications, and each drug comes with detailed directions. Byetta comes in a prefilled pen with either a 5 mcg or 10 mcg dose taken twice daily. Each prefilled pen delivers a 30-day supply. Byetta comes in a glass cartridge inside an injector pen. The active ingredient, exenatide, is mixed in water along with an antimicrobial agent. A doctor or physician assistant instructs patients on how to inject it in the skin of the upper thigh, stomach or upper arm. Patients should not inject it into a vein or muscle. The prefilled pen has a 30-day supply of either a 5 mcg or 10 mcg dose taken twice daily. Patients switch out the needle after each use but keep using the same pen for 30 days. The medication insert instructs patients to take Byetta twice a day within 60-minutes before the morning and evening meal or before the two main meals of the day. These two meals must be at least six hours apart. Patients should take Byetta one hour before the morning and evening meal or before the two main meals of the day, which must be at least six hours apart. Do not take Byetta after eating. Health care providers should start patients on an initial dose of 5 mcg to minimize gastrointestinal side effects. After one month of therapy, the dose can be increased to 10 mcg. The medication may be prescribed alone or with a sulfonylurea such as Amaryl or Glucotrol; a thiazolidinedione such as Actos or Avandia; metformin; or Lantus, also known as insulin glargine. Doctors may prescribe Byetta with DPP-4 inhibitors like Januvia, but it should not be used in people with Type 1 diabetes. Bydureon comes in a single-dose tray that contains a vial, a syringe, two needles and a vial connector. This medication is an extended-release formula, so patients only take one shot every seven days. They can do this at any time of day with or without meals. Assembling the syringe in the single-dose tray takes several steps, so AstraZeneca developed an easier-to-use version called Bydureon BCise. BCise comes in a 2 mg single-use autoinjector pen. Patients inject this formula once a week at any time of day with or without meals. They throw the autoinjector away after each use. AstraZeneca does not recommend Bydureon or BCise as the first line of treatment for people with Type 2 diabetes, according to the medication insert. People should not use insulin or other forms of exenatide with Bydureon or Bydureon BCise. Although Byetta is not FDA-approved as a weight loss drug, taking the drug along with making lifestyle changes may help people with Type 2 diabetes lose weight. In a study published in May 2010 in The American Journal of Medicine, researchers recruited 194 overweight or obese patients with Type 2 diabetes. They gave exenatide to one group and a placebo to the other. Both groups made lifestyle changes. People who took exenatide lost more weight than those who did not. And according to Amylin’s research, the average amount of weight loss for people who took the drug with another diabetes medication was four pounds over 30 weeks. Dr. Jody Dushay and other doctors and researchers at Beth Israel Deaconess Medical Center in Boston conducted a study on obese women who did not have diabetes. They published their results in December 2011 in Diabetes Care. They found the women in the study began losing weight in as little as two weeks. After 16 weeks, average weight lost was 5.5 pounds. While researchers aren’t sure exactly how exenatide helps people lose weight, Dushay and fellow study authors have theories. They say the drug may change the level of energy expenditure or cause nausea, which decreases food intake. But it may also increase leptin sensitivity. Leptin is a hormone that affects hunger and tells people when to stop eating. Obese people have less of a reaction to leptin. Despite these studies, the FDA has not approved the drug for weight loss, and there are no long-term studies on the safety of exenatide use in people without diabetes.